LEWIS Melican had reason to believe he could get drafted in late 2014, as he lay in a Gold Coast pool on Schoolies week. But the future Swan, once a Geelong Falcon and Birregurra Saint, was so relaxed about his status that his alarm reminder for the start of the NAB AFL Rookie Draft was half an hour late. It was only when Melican's poolside mobile phone started going bananas that he discovered Sydney had picked him up with the 52nd selection in the AFL's second-chance saloon. "It was exciting and I think it was a pretty good way to do it, to not be expecting anything," the 20-year-old told AFL.com.au. "There are so many people around the country who want to do it, and some of them get told early on there are heaps of teams looking at you and their head inflates a bit and they expect to get picked up. "There was no real chance of disappointment for me, because if it didn’t happen, it was what I was expecting, anyway." 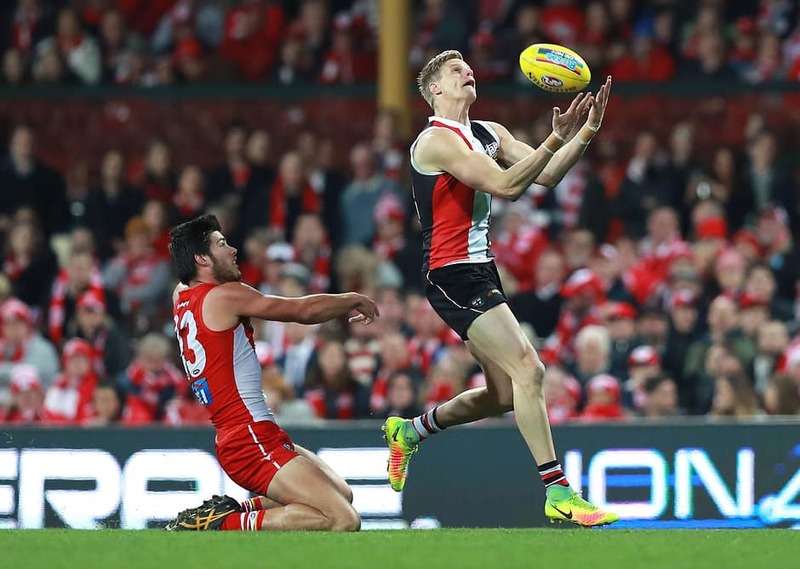 Melican's rise to being this week's NAB AFL Rising Star nominee, after keeping St Kilda champion Nick Riewoldt to 10 disposals and one goal on Saturday night, is one of persistence after repeated and varied setbacks. The 193cm defender missed the Falcons' cut in the under-16s, was a non-playing development squad member the year after, then played every TAC Cup game in 2014 to creep onto the AFL radar. Creep was the right word, because the Swans, according to Melican, were the only ones who seemed to show genuine interest. He didn't even score an invite to the state combine. Melican fits right in at Sydney, where Heath Grundy, Dane Rampe, Nick Smith, Jake Lloyd, Kieren Jack, Nic Newman, Tom Papley and Sam Naismith are among the rookie-list success stories. "You don’t really think of them as rookies anymore, after the experiences most of them have, but they all started the same place I did," he said. "I hadn't really looked into it too much (when I was drafted), but I remember people telling me that if I was to go to any club, Sydney is the right one to be at." Melican impressed enough to play in one of the Swans' pre-season series games in his first year, only for the start of a horror injury run to stifle his progress. A cracked pelvis ruined his 2015 season, then there was a broken thumb and separate right hamstring tears last year. It is easy to have a sense of humour about it now, especially after re-signing until 2020 last week, but Melican faced the end of his professional football career. A strong NEAFL finals campaign for Sydney's reserves team ensured that wouldn't happen. His shtick these days involves telling everyone how well his body has held up this year, despite suffering a hip flexor tear and a back injury. But Melican is impressing all the right people, namely coach John Longmire, who praises him as "very coachable". "He’s taken on some big challenges and played on some of the competition’s best forwards, and we’ve got confidence in him that he can do that," Longmire said. "He’s a terrific country boy who is a fairly quiet, respectful kid and he’s getting more confident every week with the more football he plays." Melican has become a fixture in a Swans side that's won seven games in a row and 10 of 11, with his versatility already enabling him to play on taller types such as Riewoldt, Jeremy Cameron, James Stewart and James Sicily, but also nimble goalsneak Toby Greene. "I never really thought I'd get anything like this (Rising Star nomination), especially as a defender – it doesn't feel like a rewarding job sometimes," he said. "We just want to play finals … the atmosphere around the club's been great lately."